Yes, you heard me. How to play single-digit golf, and it’s not that hard to do, or I wouldn’t be able to do it. I’m not saying scratch golf, that’s another matter entirely. But coming in at nine strokes over the course rating? That’s a lot of room for error. First of all, you need to be able to hit the ball straight, consistently. Not every shot, but seven out of ten need to go where you want them to, and the other three must be playable. Second, you need to be good at approach putting. Three-putt greens are most often caused by leaving the first putt too far from the hole. That said, it’s OK to be very good from four feet in as well. With your short game plus putting, you need to have a chance to get up and down from most places around the green. Know the yardages of your irons, and know how to hit them different distances. Say you hit your 7-iron 148 yards, and the pin is 144 yards away. You should know how to shave four yards off the shot. While we’re at it, play to pin-high or beyond from the fairway, Always have enough club in your hand, because you don’t always make perfect contact. Your iron from the fairway is the key to making a good score possible, so play these shots conservatively. Know what your best shots are, and hit them as often as you can. Make the course bend to your skills. Know what your weak shots are and avoid them while you’re working on them. Always keep bogey in play. Your scorecard can handle bogeys, but doubles add up too fast. Play from the right set of tees. If you’re hitting long irons or hybrids into half of the par 4s, those tees are too long for you. Finally, forget your score and just play golf. Don’t ask too much out of any shot, and thereby keep the ball in play. Enjoy yourself, play one easy, controlled shot after another, and you’ll pull it off. Here’s the formula for shooting a 79, which on most courses is single-digit golf: par all of the par 5s (20), half the par 3s (14), and half the par 4s (45). You might just stumble across a birdie or two. None of that sounds too hard, does it? 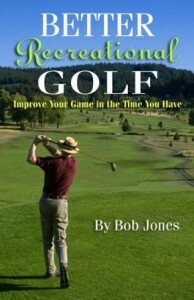 For about five years I’ve been writing blog posts devoted mainly to helping you play better golf. Most of the instruction posts have been about physcial technique, mainly because it’s the easier to write about, and you need to know it. Having good technique, though, isn’t necessarily what makes you play better. What does concerns the condition of your mind as you plan your shot and hit it. You know this is true. When you’re playing poorly, your mind is full of doubt and worry. It’s hard to hit a good shot in that state. Conversely, when you’re playing well, your mind is relaxed and full of quiet confidence. You hit one good shot after another. Nothing about your technique is different in either case. You’re the same golfer. What changed was the condition of your mind. As I have improved (begun to shoot lower scores consistently) my technique has certainly improved, but not to the degree that my scores would indicate. My mind is more relaxed than before, which allows my improvement in technique to be applied more often, and that’s the key. Fact: knowing how to hit better shots doesn’t lower your score. Knowing how to hit better shots more often does, and that part depends on the condition of your mind. 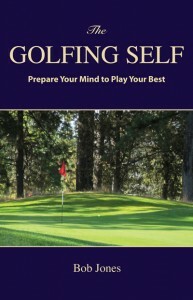 Last year I published a book that guides you through a program to develop a mind that stays clear and calm while you play. There is little I can add to it in a 500-word blog post, except to emphasize in another way how important this is. My last eighteen holes came in at 74. I played the back nine one Monday morning and turned in a 38. The next Monday morning I played the front nine and shot 36. At no time did I make what I would call a great shot. They were all good enough, shots that you can make any day. It’s just that I was making one of them after the other, and I attribute that to the state of my mind. Put another way, if you’re a 15-handicapper, I can easily say that you are just as good a ball-striker as me. The quality of my best shots is no better than yours. What I am that you are not is consistent. I hit my best shots more often because my mind stays calmer than yours does. Let me be clear on this point. A golf swing does not have consistency built into it. How you swing now does not influence in any way how you will swing the next time. That influence is entirely contained in the mind. Once you have trained yourself to the point where you know what to do with a golf club, that is, a good swing is not a matter of luck, repeating that swing is a mental activity. If there is a secret to getting the most out of the skills you have, this is it. You go to the range to learn how to play on the course better, not to hit range balls better. That sounds obvious, but from what I see at the range, and what I catch myself doing there, range golf and course golf are two different things. They shouldn’t be. As you stand over a range ball, remember how you hit the ball on the course, with the club you’re holding, when you have one chance, and it has to count. I’ll bet you make a careful, controlled stroke. That’s the kind to make with this range ball. Back on the range, seeing how far you can hit it, or trying a new swing thing just this one time, all that moves you backward in your progress, not forward. 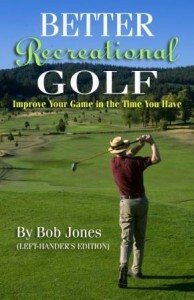 Use your golf course swing at the range. Which one is that? When I’m hitting the ball well during play, I have the feeling that I’m just chipping the ball around the course. It’s that effortless and that controlled. I get into trouble when I try to do more. More than perfect isn’t perfecter. You’re there to perfect that controlled swing. By that I mean learn to do it over and over, the same way every time. Don’t try to keep getting more out of it. Teach yourself to get the same thing out of it every time. Have you ever seen a good player at the range hit one great shot after another, with the same easy swing? That’s what those golfers are doing, learning how to repeat THAT swing. That’s what I want you to do. So on the practice tee, take your time between shots. Pick a target, line up the shot, go through your pre-shot routine, every time. Then use your golf course stroke. Around the green, whether chipping or putting, go through all the preparations you make on the course, before every chip or putt. Hit the shot like it’s on the course. There will be more time between shots, so don’t get impatient. You’re learning how to make quality shots, and that’s the way to improvement.